This painting demonstrates how completely Marin had absorbed and assimilated the teaching of his tutor, Leon Van den Houten; the presence beyond it of artists from Velasquez to Cézanne is clear (see Velasquez, Two men at a table, Apsley House), yet the choice of items, the fruit and the treatment of the glazed white bowl are completely his own. It is unusual, however, amongst Marin’s works, and may perhaps be an early example. Later on he moved to painting in a much higher key – bright landscapes and balcony scenes influenced by Bonnard, Cézanne again and Matisse; and nudes influenced by Picasso and Delvaux. 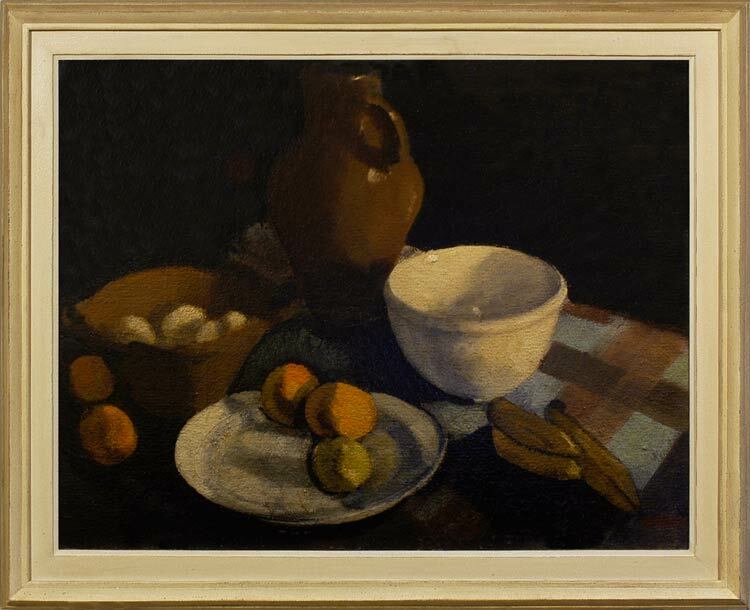 This still life is notable for its earthy plasticity and its sophisticated manipulation of light and shadow; a subtle and very attractive work. Oscar Marin was born in Charleroi, the ‘black country’ or coal-mining & steel smelting region of Belgium, about 30 miles south of Brussels. He was trained by Leon Van den Houten (1874-1944), who was a painter, designer, sculptor and ceramicist, and who taught the decorative arts at the Paul Pasteur Institute in Charleroi and drawing in the local art school. Van den Houten was naturally drawn to Impressionism, but also to the major avant garde movements. He was involved with L’Essor, La Libre Esthetique, and helped to found the Groupe Art Libre. His eclecticism influenced his students, and notably Marin, in whose work can be seen echoes of painters from Cézanne and Picasso to Bonnard and Delvaux. Marin was friendly with another of Van den Houten’s students, Gustave Camus, who in 1933 founded (with the sculptor, Georges Wasterlain) an avant garde group, L’Art Vivant au Pays de Charleroi, which included Marin. In 1937 Camus and Marin travelled to Holland and discovered Rembrandt together. Marin exhibited at the Salon of Ghent.